This entry was posted on July 9, 2016 at 11:25 pm and is filed under Adventure, Animation, Comedy, Family. You can follow any responses to this entry through the RSS 2.0 feed. You can leave a response, or trackback from your own site. This movie sounds very funny, and a few people I know who saw it had a laugh with it. Oh and thank you for being the first to post your thoughts Vinnie! Review has been up for almost 3 weeks. How odd that a review of the 3rd biggest hit of the summer failed to inspire any discussion. I’m happy to be the first to comment on it. I would have thought more people would have commented by now. This was a lot of fun. The bunny (Kevin Hart) was by far my favorite character. I thought all the other animals were good too, but the bunny made me laugh the most. The success of this doesn’t surprise me, it should be seen by many. It’s worth it. 3 1/2 stars. 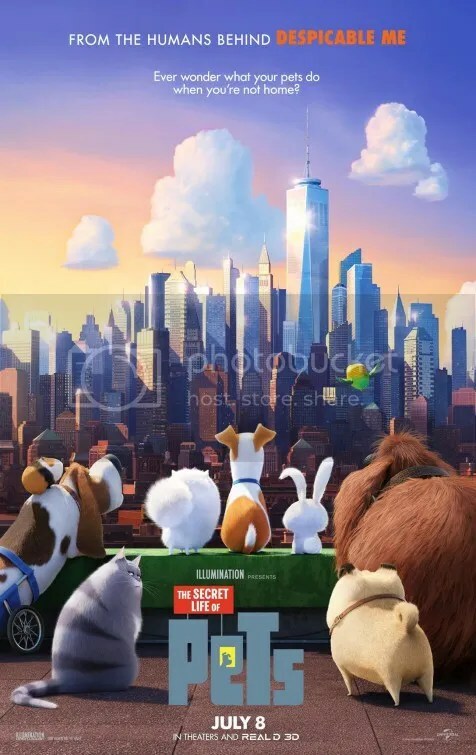 In a summer where movies drop out of the Top 10 after 3 weeks, The Secret Life of Pets has shown remarkable staying power. Animated films seem to do that. Kung Fu Panda 3, Zootopia & Finding Dory were the same way. I agree that the depth in The Secret Life of Pets is cursory and its mentality is zany. You’re right that character development is definitely minimal in favor of gags. I thought Kevin Hart was hilarious too. Even though I really enjoyed the movie I thought it was a bit too long and a bit too busy. I think the concept of pets goofing off when their owners are gone makes for a cute short, but it’s not enough to take up a whole movie without throwing other elements in there. And in doing so, they make the film’s focus kind of confusing like you say. Maybe you’re right. Perhaps it was too long, but at 87 minutes if it was any shorter it wouldn’t even qualify as a feature length movie. Ha ha. Very true. I realized that after posting this comment. Haha. I knew this movie would be huge but had no idea it would become the third biggest hit of the summer (after Civil War & Finding Dory). Wasn’t expecting that.